A new year should come with the promise of a fresh start, but a just released study examining the roles played by women working behind the scenes in the arts is singing the same somber tune we've heard again and again. The Celluloid Ceiling Report, conducted by the San Diego State University Center for the Study of Women in Television and Film, revealed that women constituted just 17 percent of all directors, writers, producers, editors and cinematographers working on the top 250 grossing films in 2016. In fact, women directed just seven percent of the top films last year, a two percent drop from 2015 and 1998, the first year the study was conducted. Perhaps even more shocking, of all the behind-the-scenes positions polled, only three percent of music composers were female. Moreover, women composers accounted for only 1.8 percent of the total pieces performed in the 2014-2015 concert season among the top 22 American orchestras. Even with the industry under arguably more pressure than ever before to change the tide and, in particular, close the gender gap, this is still a glaring problem. Yes, there are some anomalies: for the first time in over a century, the Met featured an opera composed by women in December. We celebrated Taylor Swift for being the highest-paid musician in the world. Missy Mazzoli's "Breaking the Waves" was among the year's strongest operatic premieres; Rolling Stone hailed Beyoncé's visual album the best of the year, and Ashley Fure's new orchestral piece, "Bound to the Bow," left a memorable mark at the New York Phil Biennial. Yet, for the most part, the arts and entertainment landscape remains exclusive. It's clear that this issue is deeply rooted and its prevalence widespread. So, it's time to change the tune and do our part to bring women into the spotlight. We can do this by cultivating an environment where they are welcomed, encouraged and empowered, and by investing the resources to grow their talent - as early as possible. As composer Missy Mazzoli recently said in an interview in the New York Times: "When you're young is when you receive the brunt of this sexist behavior. You don't have the defenses or the perspective to deal with it at such a young age, which is why I think a lot of women are discouraged from being composers when they're teenagers." Mazzoli is one example of an artist who is helping young women find their voice. Working in collaboration with Kaufman Music Center's youth orchestra, Face the Music, Mazzoli, along with acclaimed composers Ellen Reid, Reena Esmail and Kristin Kuster, launched a program called Luna Composition Lab. Luna Lab aims to address the gender imbalance head-on by creating role models, mentorship and performance opportunities for girls, along with providing access to a professional network of musicians. By connecting young women with established female composers, the program is starting to close the gap- providing girls with positive role models, fostering their confidence, giving them an outlet for self-expression and encouraging them to follow their dreams. 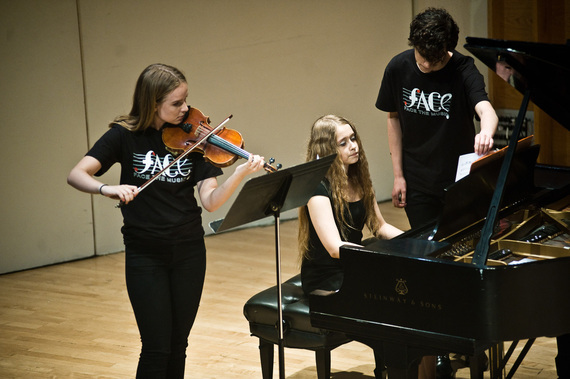 Kaufman Music Center's Luna Lab is not alone in providing young female composers a pathway. Since 2013, the organization Opera America has awarded grants to women composers to create new works and to opera companies to commission them. Similarly, the League of American Orchestras sponsors orchestral opportunities for women in the early stages of their career. The Earshot project of the American Composers Orchestra has featured the music of more than 100 women composers over the past 15 years. While these programs are going a long way to inspire young women to partake in the arts, we need the help of local communities and leaders, schools, organizations and individuals across the country to truly level the playing field once and for all. A look back at 2016 alone is evidence that there's no scarcity of talent -- women everywhere are composing, directing, writing, filming and performing monumental works. But in 2017, let's build on the momentum and help bring them to center stage.